Mud Morganfield aka Muddy Waters Jnr (2)Muddy Waters Junior was born Larry Williams in Chicago on 27th September 1954 to McKinley Morganfield and Mildred McGhee. Muddy Waters the eldest was given a drum kit by his father at one of Muddy�s infrequent visits to see his son, Larry soon tired of this and took up bass playing instead. For most of his life Larry Williams was a truck driver with a passion for music. In his spare time he would sing with various pop groups preferably the Earth, Wind and Fire type. As he grew older and particularly since his fathers funeral twenty-four years ago (where he met his half brother Bill Morganfield for the first time) he has come to enjoy and to sing in the old blues tradition. Looking remarkably like his famous father and in possession of a Muddy sound-alike voice Larry has performed as Muddy Waters Junior in various Chicago blues clubs for some time now. Up until now he has kept his profile very low and has quietly built a solid audience with childhood friends like Eddie Taylor Jnr helping him out on the bandstand. In July 2007 he stepped out into the limelight playing a show together with Big Bill Morganfield at the Muddy Waters Memorial Festival in Westmont, Illinois and straight on to his own set at the Chicago Blues Festival. He then began recording a CD which appeared mid 2008. 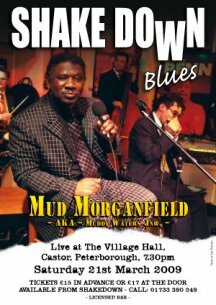 Since Muddy�s sensational sell-out Shakedown Shows 16 months ago his career has taken off with regular work rolling in both home and abroad. His name change to Mud Morganfield was forced onto him and maybe a little confusing but his audience is growing fast with festival dates and foreign tours being the norm.